Scene stealer Chantal Thuy has left a lasting impression on fans of the CW series “Black Lightning” since joining the ensemble cast in its first season. Not only is her character Grace Choi inspiring young girls to embrace who they are, but in return, those viewers are educating the Montreal native on proper comic book care. We recently sat down with Thuy to discuss Grace’s influence on the LGBTQ community, watching her develop season to season, and why the joy of the journey may lie in the mystery of what comes next. TrunkSpace: What would 10-year-old Chantal think about her future self getting to play in the DC metahuman universe? Would she be surprised? Thuy: Ten-year-old Chantal could not have dreamed that she’d be in this fortune position – it’s a dream come true! 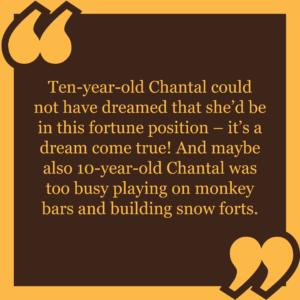 And maybe also 10-year-old Chantal was too busy playing on monkey bars and building snow forts. TrunkSpace: Your character Grace Choi is a comic book fangirl. What has the experience been like of getting to interact with the real world fangirls and fanboys who follow the series? Thuy: I’ve been incredibly lucky to have the most supportive and loving “Black Lightning” fans that I’ve grown incredibly fond of. I talk to everyone on social media but look forward to meeting them in person. They are not only super encouraging but also teach me things like not to fold a comic book in my back pocket, ever. The girls also make really great fan art, and write lovely letters. TrunkSpace: Grace seems like such an important character in that she represents the LGBTQ community and is not bogged down by cliches that other series tend to fall back on. Does it feel like your portrayal of Grace is giving young people who identify as part of the LGBTQ community a cinematic role model that they can relate to? Thuy: Yes, a million times yes. One thing I hear a lot is how much it means to the girls to have Grace take ownership of the word “bi”, and having it specified and spoken in a throw away, non-apologetic way. And I love that I can make them feel seen and acknowledged, because that has always been a primary motivator for me as an actress, was to help further representation across the board. TrunkSpace: As far as your own personal journey with the character, what have you enjoyed most about getting to inhabit Grace and see her develop further over time? 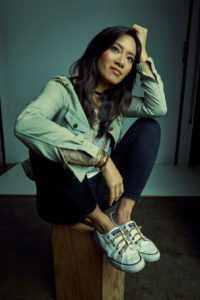 Thuy: I love that week by week, I get to discover more about Grace through the eyes of the writers and showrunners; they don’t tell me much in advance, so I am always wowing and awing at the character development. It’s all very, very exciting. TrunkSpace: Has Grace taken on a life of her own in a way that wasn’t originally intended? Are there aspects of the character’s personality that exist now that weren’t there when you first signed on to play her? Thuy: Yes, there’s definitely really interesting developments happening for Grace in Season 2 that I didn’t know were coming last year. And as the story develops, I am digging deeper into Grace’s own life story, which is very full, dark and complex. TrunkSpace: You’re playing the lead role in the theatrical production “Linda Vista,” which premiered recently at the Mark Taper Forum in Los Angeles. Does performing on stage give you a different creative thrill than working in front of the camera? Thuy: This is actually a Steppenwolf ensemble play with all the original cast members, lead by the fantastic Ian Barford. Performing on stage is a whole difference experience because you get the audience as a thrilling component in the storytelling process. It’s been incredible to work with such an amazing cast, Dexter Bullard (director), Tracy Letts (playwright) and the Center Theatre Group. TrunkSpace: What is the most challenging aspect of taking on “Linda Vista” for you as a performer? Where do you feel you will be stretching yourself the most? Thuy: It’s stretched me in some aspects of my physical comfort zones, as I have never done an intimacy scene like the one in the play. And I’ve also never worked a space like the Mark Taper Forum (which, I think, is 739 seats), so there’s a fun challenge. Photo: Carin Baer/The CW — © 2018 The CW Network, LLC. All rights reserved. TrunkSpace: Speaking of challenges, what are the biggest challenges of pursuing a career in the creative arts in 2019 and do you think those who were working 30 years ago faced the same set of challenges? Thuy: There’s still a limited number of roles for Asian American actresses, and the depth and complexity of the roles available are varied. So I feel very lucky to be exploring the characters I am currently portraying, and I hope that the richness and amount of roles available for women of color will continue to rise as we continue to more accurately represent our current society. But we are still fortunate in our present day circumstances because I know it was even tougher for Asian actresses 30 years ago. Thuy: I think this past year has truly been a blessing. I’ve been praying to be able to make an impact as far as representation, and also hoping to work in theater more. Being able to do both these things this year feels surreal. Thuy: I think I’d always like to know, out of curiosity. But I most likely would say no, because I’ve learned that part of the process of life is having to surrender to the good and the bad. I think not knowing makes you have to develop more faith, more strength. And maybe not knowing makes the journey that much more fun and rewarding. “Black Lightening” airs Mondays on The CW.